Ever thought much about what it means to have enough…? Work – job, yard work, house cleaning – enough! Bills, telemarketers, commercials – enough! Bombarded by questions, can’t take one more – enough! Tantrums and whining from your children or grandchildren – enough! Then all of a sudden your the parent whose feeling guilty that you’ve had a rest from the kids and you’ve just got them back and you are already saying to yourself…..enough! Vacation – great time, but ready to be home again – enough! I was recently at Busch gardens. Rode lots of roller coasters. One too many led to nausea – Enough! Food – Chocolate cake, that last bite…feeling in your belly…too much – Enough! And then there is us – you and me – your self – the way we see our self, understand our self, carry our self, even the way we love our self. Are you enough? 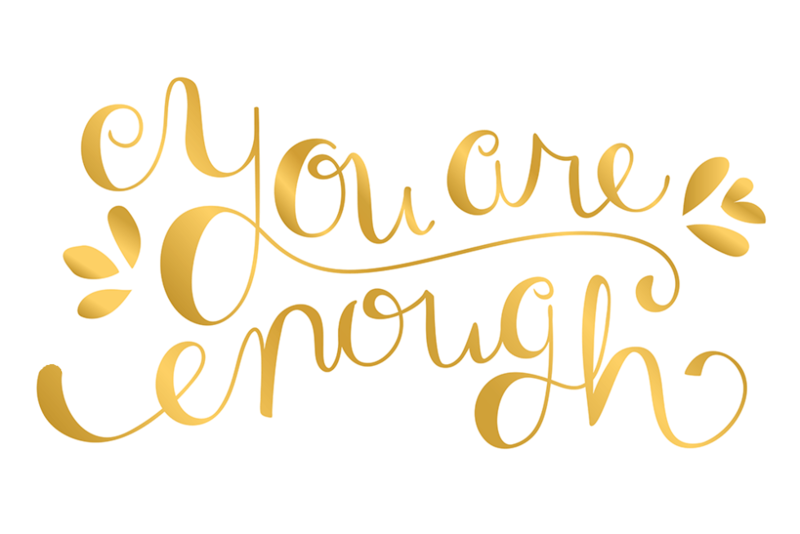 Do you feel like you are enough? Do others see you as good enough? Do you believe you are good enough? Have you felt like no matter how hard you try, how much you do, it’s never enough…? Are you comfortable enough, satisfied enough? Happy enough? Are you enough? I think most of us, if not all of us, suffer from feeling like we are not enough….on some level, in some way shape or form. Some of us have been criticized so much throughout our lives – as a child, a youth, a working adult, – that we began to feel like we weren’t enough…and it went on so long that we began to believe we’re not enough. Some have been compared to another person – a sibling, a coworker, our parents – so much that we began to see ourselves as not enough. A particularly difficult or painful life experience, a physical condition we developed that causes you to struggle with even the most basic daily routines, a particularly demanding life circumstance….all of these can lead to feeling like you are not enough. So no matter where you find yourself along life’s journey, no matter how confident you are, no matter how successful you may be….we all come across moments where life brings us to the edge of our belief about ourselves, provoking that question in our heads: Am I enough? And here is where we we reminded about a man from long ago who struggled with being enough. Moses – if you think about it, before the great exodus, he was never really enough.. The infant who was Sent away from his family….we know the story, but Moses would not have – and a child sent away from his family ends up questioning himself later in life – why was I not enough for hem to keep me, to love me? And then he kills a taskmaster because of this tension – and he wasn’t brave enough to stick around and face the consequences, he wasn’t strong enough to stand up for what was right to the people who could create change, he wasn’t bold enough to really make a difference….he wasn’t enough. And so he runs away, in fear for his life. Probably a little Atelophobia going on, you think? You have to appreciate the irony here. You have to laugh about this, right? Moses whose life exemplifies not being enough is now face to face with an angel of God – or at least face to branch with the divine in the form of a bush that was so strong, so plentifully fueled that it couldn’t be consumed by fire. The bush was enough, so much enough that fire could not destroy it. And yet Moses felt exactly the opposite…and so he stopped to stare, he was mesmerized by this sight. Sure it was a crazy thing to observe….but the irony in this story is begging us to see that the one who felt inadequate could not comprehend something so infinitely adequate that fire could not burn it up. And what does God say? Remove your sandals…take off your shoes…you are standing on holy ground. Now I want to pause here. We almost always teach that this shoe removal is about standing in the sacred presence of God. As a young person I remember a youth worker in my home church would take his shoes off every Sunday in worship. And he always told used the story of Moses and the burning bush as justification for his shoe removal. It was a joke, an excuse to be comfortable really. But the irony there is the desire to be comfortable was not enough. Comfort was not an acceptable excuse in church, so he had to appeal to the common interpretation of this verse that God’s house is holy so we should remove our shoes in reverence and respect of God’s holiness. And yet it was really about being comfortable….think on that for a moment. Then God does something kinda crazy. God sets out on the “single largest rescue operation in the entire bible.” And though he could have done it alone, he chooses Moses….Moses! A child who barely survived a mass killing of children. Moses – A Hebrew who would have been Egyptian royalty, but screwed up. Couldn’t handle it. Moses – a man who ran away from his problems, Ran away from his royal life for fear, a man who spent more time with the enemies of his people than his own people (first the Egyptians and then the midianites). Moses – a man who appears to have lied to his wife and father in law – apparently allowing them to believe he was an Egyptian. Moses – a man who was anything but courageous, slow of speech and slow of tongue, and made excuses at every turn. God was interested in Moses to help carry out the largest rescue mission in the Bible. And Brothers and sisters, surely if God is interested in a man like Moses, then he is interested in you. Surely if God is willing to entrust the single largest rescue mission in the entire bible to a man like Moses, then God will entrust great things to you as well. Surely if God so deeply loved a man like Moses, then God loves you. Surely if God brings home a man so outcast, so criminal as Moses, then God wants to bring you home as well. Moses: Well, what if they ask me your name, God? God: Ok, God says…here is what you tell them: Yahweh sent you. Translation: I am who I am sent you. I will be who I will be sent you. You have to understand how funny this is! Moses who cannot even fathom the possibility that he is enough, that who he is is enough, he is supposed to go out and tell the Israelites: I am who I am sent me. I am who I am. And I will be who I will be. I am enough. God is the ultimate in being enough, in understanding enough, in affirming enough-ness. And I think that part of what this story about Moses and a bush that was so enough it couldn’t be consumed is meant to teach us is that we are enough, we are made in the image of a God who is enough. God defines himself through a name that asserts I am enough. And God reaches out to us humans – made in his image – to call us to take off our shoes and be comfortable with who we are and who God is – to embrace the enough-ness of you, the enough-ness of this moment, the enough-ness of God’s love, the enough-mess of God’s loving interest in your life, the enough-ness that God can and will use you for his good work within this good creation. God is enough. God made you enough. God loves you more than enough.